This week we talk of art (visual) with Tim, Kat and Rob, including Tony Hart, GCSE coursework, Candice Breitz and Pop about Art. Featuring music from Art Brut, Solange Knowles, Marilyn Manson and Sportique! Tim Hopkins, Steve Hewitt and Clare Spencer join me – Pete Baran – flying by the seat of our pants and talking about safety, danger, the extended mix of the Safety Dance, “if I scream if I wanna go faster what do I do if I wanna slow down”, driving lessons, ELEPHANTS = DANGER and far too much time spent discussing iron cords. With music from Half Man Half Biscuit, Alpha Blondy, Blahzay Blahzay and a rubbish Men Without Hats Song. 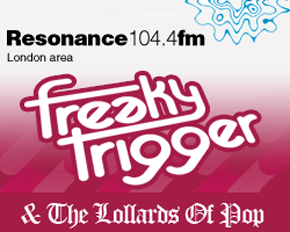 The Lollards return to Resonance FM 104.4‘s London studio with host Elisha Sessions. He’s joined by Alix Campbell, Magnus Anderson and Alex Macpherson for a discussion of KID POP – kids who sing pop and what pop kids like – not really the same category, as we discover (bling-eyed svengalis take note). We hear singles from our panelists, Frank Kogan talks about old television and why people fall out of love with music, we hear 9-year-old Willow Smith’s new single and of course we share the hotly anticipated results of the FT kid pop poll with you. After last weeks skip week, Freaky Trigger finishes its epic run with a special double length episode coming LIVE from Glastonbury (sort of). Pete Baran is joined by Nick Dastoor, Magnus Anderson, Cecily Nowell-Smith and Mark Sinker to talk festivals and the end of the world. Which to some is the same thing. Music from Bowie, Young Marble Giants, The The, and many many more. Thank you for listening! Two hour long podcasts here so we can maintain quality. All four sports-bloods: Steve H, Tim E, Tim H and TimPete B. Featuring Elbow, Horse Man and a song about football. Steve H, Magnus A, Hazel R and Julio D give a surprise test. Featuring Mr Kirk’s Nightmare William Shatner, Tiny Tim, Richard Barrett, Tori Amos and… hmm, the Goodies? Lollards Of POX more like! Pete Baran, Rob Brennan, William Swygart and Bec Toennessen – licensed to ill. Featuring Cherry Melody’s “Chickenpox”, Booker T and the MGs “Chickenpox”, White Stripes “Girl, You Have No Faith in Medicine”, Beastie Boys “Time to Get Ill”, the Quincy theme, and Siobhán Donaghy “Medevac”. Feverish about the fanciful, fanciful about the feverish – dropping medicine so you can pick it up. Feel free to tell us that we shouldn’t be so mean about homoeopathy. It’s a two-fer today as we finally get last week’s recording sorted out. This week: Fear. Pure fear. Tim Hopkins, Pete Baran, Mark Sinker, Kat Stevens and Elisha Sessions play ostensibly scary music and absolutely no Toby Keith in what must be a Lollards first. All tracks are identified on air – I can’t even remember what they all are now – but I did make good on my promise to play the Billie Jean demo (which is NOT the one floating around on Youtube by the way). Originally broadcast Sat. May 23, 2009 on Resonance FM 104.4.